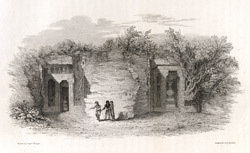 Engraving of the cave temples of Chandowlee in Malwa by Edward Francis Finden (1791-1857) after Patrick Young Waugh (1788-1829) plate 12 of the 'Annals and antiquities of Rajast'han or the Central and Western Rajpoot States of India' published in London in 1832. James Tod, who was the first to record these monuments, wrote: "By mistake, I have engraved the name of Chundowlee, the adjacent village, instead of Dhoomnar." At the hilly site of Dhamnar there are more than fifty Buddhist rock-cut cave temples which belong to the 4th-5th Century of the Gupta era and a Vaishnava monolithic temple from the 8th-9th Century, Pratihara period.